Ananka's Diary: Whatever You Do . . . Don't Drink the Water! Kyleray Katherman had a problem. The drinking fountain water at his Oregon middle school tasted like sludge, but bottled water was banned on school grounds. The thirteen-year-old figured he had two options. He could run the risk dehydration—or he could take matters into his own hands. Like any unusually named hero, Kyleray chose the latter. With a box of Q-tips as his only weapon, Kyleray took on the water fountains at Oregon Coast Technology School. He swabbed their spigots and allowed the bacteria he collected to grow in Petri dishes. But the real stroke of genius? He also took a sample from a toilet bowl for comparison. The results were truly nauseating. 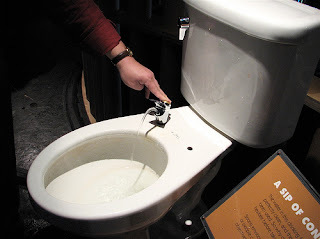 The toilet bowl water was clean and potable. The water fountains, on the other hand, were teeming with foul bacteria. With his findings in hand, Kyleray urged school administrators to either rescind the ban on bottle water—or supply water coolers for the kids. Their reaction? They simply cleaned the existing water fountains. Oh well. You can't win every time. But Kyleray has earned a place in the Irregular's hall of fame. Wow... thats really gross. at leat at my school they let us drink bottled!